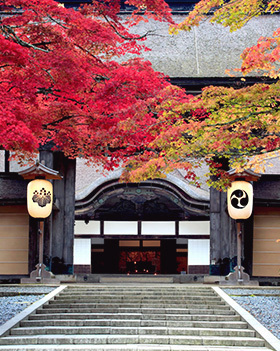 Koyasan is one of the most important Buddhist temple complexes in Japan. This World Heritage monastic complex of 117 temples is dedicated to the study and practice of esoteric Buddhism : Shingon was introduced to Japan by a monk named Kukai (posthumously known as Kobo Daishi). Kobo Daishi began teaching Shingon Buddhism in Japan in 806 AD, after returning from Tang Dynasty China; ten years later he was granted permission by the Imperial Court to build the remote mountain complex that is present-day Koyasan. The most sacred areas in the temple complex are the Danjo Garan and Okuno-in. Danjo Garan marks the site of the first temple erected by Kobo Daishi. To the east of Danjo Garan is Okuno-in, where Kobo Daishi is said to be in a state of eternal meditation, and where his mausoleum (Kobo Daishi Gobyo) is situated. 52 of the 117 temples in the area accept guests for overnight shukubo stays. Koyasan is a wondrous place to contemplate and seek respite from daily life. 1,200 years of history and natural beauty wait to envelop you in their calming embrace. From Wakayama City, take the JR Wakayama Line train bound for Nara and alight at Hashimoto. There, change trains to Gokurakubashi, where a cable car will take you the final distance to Koyasan Station—867 m above sea level. Leaving Wakayama at 9:04 a.m. will get you to Koyasan cable car station at 11:07 a.m.
With an average temperature of 11°C, warm dress for the mountain climate is recommended. Mountain areas in Wakayama receive the highest rainfall, so rain gear can come in handy. Koyasan can also be reached by express service to Gokurakubashi from Osaka's Namba Station. If taking this route, consider purchasing the Nankai Koyasan World Heritage Ticket —a round-trip fare including a 2-day bus pass and money-off coupons for use at Koyasan. To make Koyasan your first port of call after landing at Kansai International Airport, take advantage of the daily bus service departing at 10:10 a.m. The bus arrives in Koyasan at 11:55 a.m., and bookings can be made online . Although most sights in Koyasan are within easy walking distance, a convenient bus network is also available. If you plan to rely heavily on buses, make sure to pick up a 1-day pass available at the bus station outside Koyasan Station. For a personal touch, why not try a guided tour? 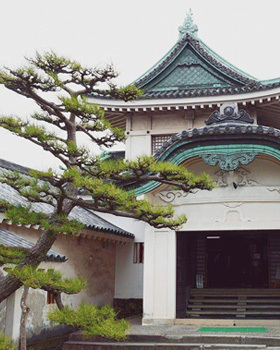 Contact Koyasan Visitor Information Center to arrange a custom program, or take part in one of their three Wednesday walking tours, held weekly between April and October. The center has irregular opening hours, so check their homepage for details. To get here, take one of the buses from Koyasan Station and alight at the Senjuin-bashi stop. The Koyasan Shukubo Association arranges temple accommodation (shukubo), shojin-ryori lunches, and other Koyasan Buddhist experiences such as Ajikan meditation. Useful amenities include: coin lockers for luggage storage, bicycle and audio guide rentals. The audio guides cost ¥500, and provide insightful commentary on Koyasan's highlights and are available in English, French, Chinese, Korean, and Japanese. There are a variety of lunch options around Senjuin-bashi, and along the road connecting Okuno-in and Danjo Garan Scared Temple Complex. Many restaurants have English menus along with plastic replicas of the menu items on display. Keep an eye out for Koyasan delicacies: koya-dofu (freeze-dried tofu) and goma-dofu (sesame tofu). Not staying in a shukubo overnight? Have the Shukubo Association book a shojin-ryori lunch for you at one of the temples. Buddhist vegan lunches start from around ¥3,000 per person. The Danjo Garan Scared Temple Complex is one of the two most sacred areas in Koyasan. It is here that monk Kobo Daishi began construction of the monastic complex atop Koyasan in 816 AD. Wander through the complex taking in the various sights, but don't pass up on the opportunity to enter the 48.5-meter high tahoto-style pagoda, Konpon Daito. It contains exquisite Buddhist statues and images, as well as a rare three-dimensional Buddhist mandala – a symbolic picture of the universe. Admission to Konpo Daito is ¥200. Combo tickets covering admission to various venues including Konpon Daito are available at Koyasan Shukubo Association Offices for ¥1,500. Get a close-up look at some of Koyasan's most prized art treasures. Built in 1921, the museum houses innumerable works of art that include Buddhist statues, decorative hanging scrolls, and mandalas. Just across the road from Danjo Garan Scared Temple Complex, it's also an ideal option on a rainy day. Without a combo ticket, regular admission is ¥600. In bygone days, the entirety of Koyasan was called Kongobu-ji. Since 1869 however, it refers only to the temple standing on the former sites of Kozanji and Seiganji temples: the two were combined to create one large temple functioning as the administrative head temple of Koyasan Shingon Buddhism. Here, you can gaze out upon Banryutei— Japan's largest rock garden. Its sizable granite rocks depict a pair of dragons emerging from a sea of clouds. The sliding doors (fusuma) within the temple are well-worth seeing: decorated with images of the four seasons and tales of Kobo Daishi's time in China. Admission is ¥500 and includes a bowl of green tea in the large rest area, Shinbetsuden. Combo ticket holders are entitled to free admission. Of the 117 temples in Koyasan, 52 provide lodgings, and these shukubo are the way to go when staying overnight in the area. Temples serve shojin-ryori, vegan cuisine prepared in line with Buddhist teachings, and welcome guests to take part in temple activities that include meditation, morning services, and other rituals. Check in early to enjoy the complete temple-stay experience. Certain temples are more geared towards accommodating overseas visitors with multi-lingual signage and monks that speak a second language. It is advisable to check with Koyasan Shukubo Association to find a temple that best meets your needs. Reservations are strongly recommended. Payments are typically cash-only. 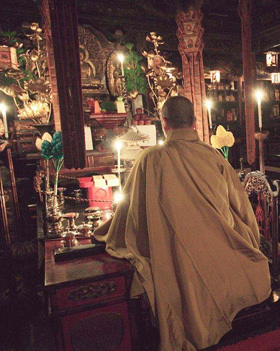 Leave the world of the living and join Ekoin temple's Okuno-in Night Tour. When night falls, a young monk will lead you through the stone lantern-lit sacred grounds of Okuno-in. Here you will find over 200,000 monuments and graves for some of Japan's most prominent feudal lords. The young guide will recount Okuno-in tales and secrets, while introducing some of Kobo Daishi's teachings. The daily tour conducted in English, leaves from Ekoin at 7:15 p.m. It costs ¥1,500 and bookings can be made through Koyasan Shukubo Association or directly at Ekoin. A special lantern procession through Okuno-in is held each 20th of the month. Organized by the Koyasan Shukubo Association, visitors are loaned lanterns and walk together up to Torodo (Lantern Hall) where a short Buddhist service in Japanese is held. Departing at 7 p.m. from the Ichinohashi Office, reservations are not required and participation is free. The auspicious March 20th ceremony, commemorates the eve of Kobo Daishi's said entrance into a state of eternal meditation. After seeing Okuno-in by night, it is well-worth visiting this mystery-filled landscape by day. Walk the path up to Gobyobashi, the third bridge; the most sacred ground is beyond this bridge. As you approach the innermost sanctum, amidst the grove of tall cedars, and moss-covered weathered tombs, you may even feel the solemn ambiance quieting the mind. Torodo, a picturesque hall of worship decorated with donated lanterns is located here. These thousands of lanterns, are the last spot to view before heading behind the hall to Kobo Daishi Gobyo, the mausoleum and place of eternal meditation of the founding monk of Shingon Buddhism. Concluding a Koyasan sojourn, visitors often honor Kobo Daishi and offer prayers for world peace. With return journeys to Wakayama City and Osaka taking approximately 2 hours, aim to leave Koyasan a little after lunchtime. 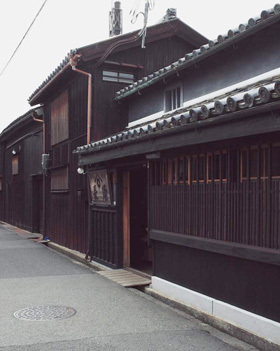 If you are looking for Koyasan souvenirs, stop in at the gift shops located in town. Items range from hand-crafted goods, regional foods to prayer beads (juzu) and other Buddhist paraphernalia.